I promise this will be the last cupcake shot for a little bit. I wanted to get a good detail shot of the frosting as it swirls around the cake. 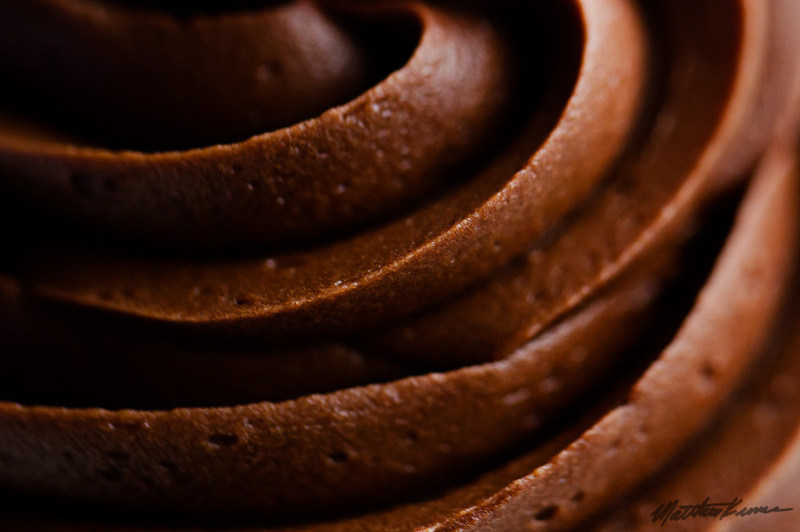 The chocolatey goodness, oh so good… sorry, got distracted there. You can see the depth of field issue that is usually found with getting so close to the subject. The DOF is extremely narrow. This was shot at f3.5, ISO 400, 1/160 of a second on a 60mm macro lens in natural light. If I increased the aperture the exposure would have been incorrect, and I was shooting it a little bit dark anyway. Another way would have been to move back from the subject with a longer focal length. That is one of the main advantages of longer focal length macro lens. You can still fill the frame with massive detail, but you get a boost in DOF. But overall the shadows, highlights, and detail in this picture just make me one thing. Hungry for another cupcake. This entry was posted in General and tagged Food, Photgraphy. Bookmark the permalink.